Retail Price: $25.98 Log in for LOWEST PRICE! A long time ago in a place far away, people actually drank Gewurztraminer. Probably after the Neolithic Age. Okay, so not that long ago and not that far away, but one thing is for certain: When people did drink Gew?rztraminer, it was usually Handley. In 1978, Milla Handley moved to Anderson Valley to work in wine. She was not the first woman winemaker here, but she may have been the first woman winemaker to found a winery. In 1982, Handley Cellars was born. Hard to believe that was 36 years ago - and that she made her reputation with a grape most people couldn't pronounce. Handley Cellars still produces some of the most delicious Gewurztraminer in California to this day. Anderson Valley is in Mendocino County, just a few miles from one of the most beautiful coastlines in the world. The vineyards are completely organic, meaning no pesticides or herbicides have ever been used. How much this fact impacts the final taste of the wine is still open to question. 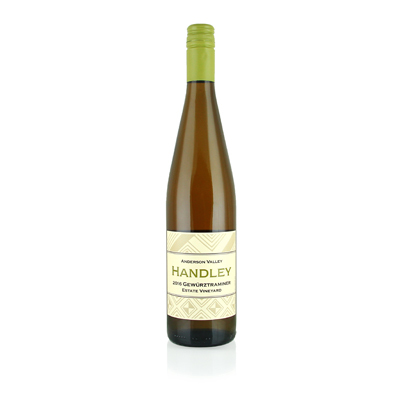 But there is no question that Handley makes one of the best Gewurztraminers anywhere. It would be hard to pick a favorite out of the few who still make it, but most of them would come from Anderson Valley. I'm not sure how or why Gewurztraminer lost its luster, but from being one of the most popular whites around, it has lapsed into obscurity. This is most unfortunate, since most of the people - make that all of the people - I have shared this wine with absolutely love it! This virtual fruit basket of wine features apricot, lychee, passionfruit, musk and spice - and that's just the beginning!